Beautiful 2 bedroom/2full bath, 2 living areas, open kitchen, spacious condo. Located in the new remodeled "Mare" formerly ESJ Azul and ESJ Towers. Enjoy the ocean breeze from your private balcony. Relax in the formal living room, furnished with new leather couch and lounge chair. Our condo is large enough to feed a family of 8 in the large dining area. Condo fully equipped with all amenities of home. Pool is fully remodeled with hot tub and childrens pool. New gym located on B-1 level with state of art equipment. Lounge at the Cielo Bar in the lobby while the kids enjoy the play room with arcade games, billiards and ping pong table. Enjoy coffee, your favorite latte or cappuccino, and deli treats at the Mare's new coffee bar, located next to the lobby. Best of all ESJ is directly on the beach - walk to lobby and continue 20 yards to the beach - your vacation couldn't be any easier! Ask about our unit next door(#895230) which can be rented as well if you have a party of up to 12! Experience all the joys the Caribbean has to offer in these Ocean Front Gems!! 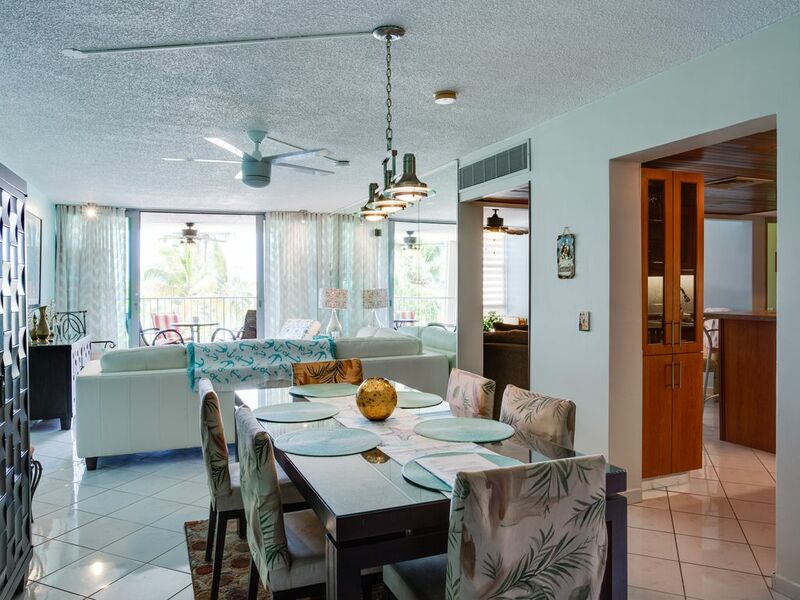 Located just minutes from the San Juan airport, these OCEAN- FRONT condos offers super-easy access from the states and provides numerous amenities the whole family can enjoy! Our condos speak for themselves- many many repeat customers- make sure you check out our reviews! Our first unit boasts 2 bed/2full (one handicapped accessible) remodeled baths, formal living area with new leather furniture, updated kitchen and a 47" tv/DVD. This unit has 2 living room areas! One with a TV and one that overlooks the palm trees and beach. All bedrooms have TVs. Our other recent updates include new paint throughout and custom drapes. We pride ourself on our visitors comfort. Our second unit boasts 2 bedrooms and 2 full baths. Completely remodeled (Jan'19) including new quartz kitchen, new bath, furnishings, new paint and tile flooring throughout, new beddings, towels, and beautifully decorated. Enjoy the convenience of a washer and dryer in both units. Both condos have central air. Spectacular ocean views are viewable from all rooms with plenty of space on the porch to enjoy the beach views and pina coladas. Puerto Rico is an American territory- no passport required for US citizens!! Just pack your bags and prepare to relax! Soak in the hum of the Caribbean's gentle waves from your private ocean front balcony, with nothing but palm trees and sand between you and the clear blue water!! Complex also offers a huge pool with daily bingo (for kids and adults alike), a poolside bar, easy beach access, pool table and pingpong located in the lobby, a game room, a lobby bar, internet and a new cafe to enjoy your favorite latte! Elevators provide easy access to the unit after your Old San Juan shopping sprees! If you seek entertainment, you'll be in the heart of everything! Just within walking distance are casinos, 5-star restaurants, nightlife & shopping. Take a short cab ride or UBER to enjoy Old San Juan, the rainforest and much, much more!! The Mare is a gated community, which provides you the peace of mind that your entire vacation will be spent without the nuisance of public access to the pool, game room, sauna, etc. The only thing you'll have to worry about is how to enjoy your relaxing, sun-filled days!! I am from Cape May, New Jersey and have been coming to the beautiful island of Puerto Rico for well over 30 years. I have had the privilege to share this home with my parents for many years. My parents wintered here and loved Puerto Rico. They are both deceased but their memory lives on in this special condo in the ESJ Towers. In January 2015 a new master bath room was installed which is handicap accessible. Our condo is one of the most beautiful in the ESJ with a new hall bath and new kitchen and stainless appliances that was completed in 2008 and 2009. My parents prided themselves on making their condo beautiful. Our apartment was a 3 bedroom that was converted to a 2 bedroom. Unlike other units here ours offers a large formal living/dining area and a comfy rec room with a 47' flat screen tv. Our family has enjoyed many years in Puerto Rico and we're sure you will too. The second unit is right next door to other unit - remodeled in Spring of 2016. Features new TV's, new furniture and appliances, new bedding, dishes, pots and pans. Unit boasts 2bedrooms and 1.5 baths with ocean view. Very bright and airy. My parents vacationed on this wonderful island for over 30 years before settling in San Juan in the Isla Verde section of town. They loved the convenience of the night life, restaurants, beach, grocery store and airport. The ESJ Towers are in the heart of everything and just a short drive to Old San Juan and south towards Fajardo and Carolina. Before my parents purchased their condo they vacationed at the ESJ for several years. The were sold on the ESJ because of the many amenities that are offered. They especially liked that the ESJ is gated and has 24 hour security - an added benefit to any property. The staff is exceptional and very accommodating. My family always enjoys what Puerto Rico has to offer and how easy it is to take advantage of while in the ESJ Towers. There is a concierge located right in building! We have taken trips west to see the Taino Indian Ceremonial grounds, visited Rincon, the phosphorescent bay, Ponce, snorkeled and dived in Fajardo, toured Ponce de Leons house in Old San Juan and ate at 5 star restaurants and shopped at our favorite mall 'the Plaza of the Americas'. The new Mall of San Juan will be opening March of 2015 and is conveniently located a short drive away. The Forts in Old San Juan are spectacular and educational! We have taken advantage of all this island has and hope you will as well. It is so easy to get there from the states. USAir and American have several direct flights from many states in the US. Once you arrive in San Juan you are just 5 minutes from your beach vacation. Best of all Puerto Rico is 86 degrees most 365 days of the year - unlike some frosty southern states in January and February and only 1 more hour by plane! The owner and the individuals property are KEY. We took a chance and were blessed with both. The "chance": Our first experience with owner, the Mare St. Claire and Puerto Rico.Reviews swing wildly,who can tell where the truth lies right? Let's start with the owner.Top Notch.Responsive.Loves PR and wants others to love it as much. Judy is kind, honest and our experience with her validates.Her property is the right "mix". View=great slice of beach. Amenities=all comforts of home. Location within property=access to pool and beach made us feel like VIP's-really convenient.Everything is pretty much up to date & functional.Climate control=great. Is it one of those sleek contemporary sterile places? Part of it is - the main dining and living area that leads out to the balcony with the views that enchant. Would it be nice if these windows & views were in every room room? Of course, but that is not the way the building is laid out. The other rooms don't have the views, but the second living room area has a comfy den-like feel. The bedrooms have small windows to let light in and don't offer views, but those rooms are for sleeping right? Living in the space, we began to appreciate the variety-it really does grow on you-has a really warm feel. Bigger picture, the Mare St.Clair property is under new ownership and it seems they are in transitioning/updating mode. Has to be tricky because within the Mare property, there are people who privately own rooms like Judy- some rooms are like hotel accommodations - some are time share. Dealing with all these interests must be a challenge. Maybe the reason that the reviews swing wildly.Really depends on WHO you get the place from. Updates being made are evident and impressive-pool: Nice- lobby contemporary,clean,international feel w/coffee shop/deli/cocktail lounge, gym -all pretty sweet.Staff were professional respectful and willing to help. Mare is located in an area where we felt safe, a choice of decent restaurants are in walking distance - as is a 24/7 grocery store that has everything you need, including liquor, fresh produce, baked goods etc-ONLY negative to report is the food at the pool needs much more attention - you are better off getting fresh from deli lobby and taking poolside. Finally, PR. Could wax on about how much it has to offer. A diverse/beautiful/adventurous place & still part of USA yet feels more exotic-out of your comfort zone but still comforting-makes you feel alive-just the right mix! The property was beautiful and the layout was perfect for the composition of our party. Additionally, the location was perfect. Between the pool and beach they were both just feet away from our doorstep. The staff on site were pleasent and helpful. Pictures do no justice for how great the place is! Upon arrival, we found a super clean living space with great furniture, great decor, and a very inviting space. The balcony has the most amazing view of the beach and beautiful Caribbean waters. Everything you needed was in the place which was absolutely immaculate and very spacious. The apartment is conveniently located minutes away from the airport with all of the accommodations that you could possibly need just one floor away. Restaurants, casinos, markets, CVS and tourist attractions are just walking distance from the property. The owner is absolutely wonderful to work with and could not of be more accommodating. Top notch! You will not be disappointed. From the initial reservation to checkout the owner was great. Answered all questions promptly. Condo facilities are great and unit is clean and spacious. Condo right on beach and pool right by unit. Would highly recommend. It was the perfect accommodation and location for our vacation. We enjoyed every second at this beautiful condo. It was very clean and spacious. The owner was very attentive and sensitive to making our stay the best. I would highly recommend this condo to any family who wishes to experience the best of San Juan. Casino & several 5-Star restaurants within walking distance!